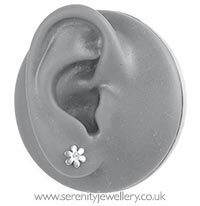 Hypoallergenic surgical steel 7mm daisy flower stud earrings with 2mm clear crystal centre and surgical steel butterfly backs. These earrings have been great for my daughter who has been struggling with allergies to other products since getting her ears pierced. They are completely flat at the back which makes cleaning around them easy and they are not digging into what was a sore ear. Great product and a fantastic price. 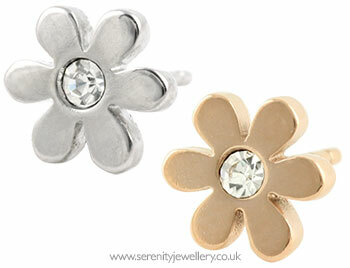 I ordered these daisy earrings for my daughters. They look very cute, and are practical for school as well (& at an affordable price!). We recommend them! Have bought quite a few pairs of surgical steel earrings from serenity as these are the only type I can wear without them hurting my ears. Absolutely love these just as much as all the rest I have bought. My daughter loved them, exactly what she wanted! These are lovely earrings. Suitable for children or adults. Perfect for sensitive ears. I bought these for my granddaughter who has an allergy to silver. She was thrilled with them. I will be buying some others of a different design.